Kinect for Windows SDK 1.7 now available as on March 18, with Kinect Fusion. The new v1.7 of the SDK, comes with the new and improved Human Interface Guidelines (HIG) and Kinect Fusion, informs Microsoft Kinect team. In addition, it also includes an enhanced developer toolkit and additional developer resources, including: OpenCV and MATLAB samples, Kinect for Windows Code Samples on CodePlex, and Kinect Interactions tools. Kinect Interactions tool lets businesses and developers create intuitive and ergonomic applications that are intelligently based on the way people naturally move and gesture. “With Kinect Interactions, businesses can more quickly develop customized, differentiated solutions that address important business needs and attract, engage, and delight their customers. The interactions include push-to-press buttons, grip-to-pan capabilities, and support for smart ways to accommodate multiple users and two-person interactions,” explains Chris White, Kinect for Windows Senior Program Manager explains. Kinect Fusion fuses together multiple snapshots from the Kinect for Windows sensor to create accurate full 3-D models of peoples and objects. “Developers can move a Kinect for Windows sensor around a person, object, or environment and “paint” a 3-D image of the person or thing in real time. These 3-D images can then be used to enhance countless real-world scenarios, including augmented reality, 3-D printing, interior and industrial design, and body scanning for things such as improved clothes shopping experiences and better-fitting orthotics,” White explained. Kinect for Windows SDK 1.7 can be downloaded through this link. Also, Microsoft has released a new MSN experience, optimized for a true mobile reading and viewing for iPhone, Android, in addition to already available on Windows smartphone platform. By just entering “msn.com” in a mobile browser, you can now get the latest movie showtimes, stock quotes, car buying advice or how to entertain for your next dinner party. The new MSN is rebuilt and optimized for touch-based intuitive user experience, letting you tap on the image to view the article or tap on the channel header to view all the top articles within each channel. Tapping the MSN logo at the top of any page will take you back to the homepage. Additionally, you can pin or save the new MSN to your Home Screen and when reading an article, a right swipe brings the next article in the channel. While on mobile, Microsoft Windows Phone team in a new series helping developers to build apps that run on both Windows 8 and Windows Phone 8 while maximizing the amount of code reuse between the two platforms. “The series provide an overview of data binding and view models, which sets the scene perfectly for an introductory video on using the Model-View-ViewModel (MVVM) pattern to promote separation of concerns and the use of modularity in your apps,” Microsoft stated. Finally, “a session highlights various tips and best practices, including info about using portable class libraries, sharing source code, class inheritance, conditional compilation, and partial classes and methods,” the team adds. Full series of Building Apps is available here. 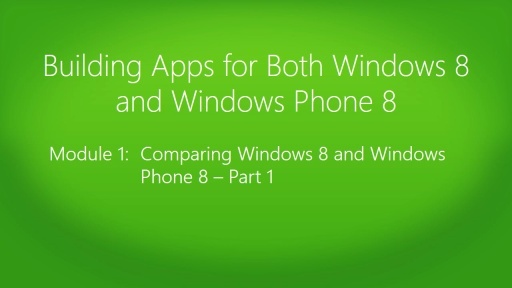 And, Build Apps for Both Windows 8 and Windows Phone 8 Jump Start by Microsoft Virtual Academy can be viewed here. Update 03/18: A new Microsoft Widows Phone support document published indicates that that support for both the Windows Phone 8 and Windows Phone 7.8 ends in the second half of 2014. To be more precisely, July 2014 for Windows Phone 8 and September for 7.8.